Three Fields Entertainment, the makers of Dangerous Golf, are working on a new game that seems to be a clone of the Crash mode from Burnout 3: Takedown called Danger Zone. It may be hard to remember since it was 13 years ago, but the idea behind Crash mode was to drive a car into a busy intersection in an attempt to cause as much damage and destruction as possible. Cause enough damage, and a “Crashbreaker” would become available which turned the car into a bomb that could be detonated for even more damage. Although that was just a description of a mode from Burnout 3, it might as well have been a description of Danger Zone because it is virtually identical from a gameplay standpoint. It even includes the Crashbreaker mechanic, which Three Fields is calling “SmashBreaker.” Also, judging from the slow motion destruction found in Dangerous Golf, it would be highly likely that Danger Zone will also feature slo-mo wrecks just like Burnout 3. These similarities are not so surprising when you consider that Three Fields Entertainment was founded by Fiona Sperry and Alex Ward, the creators of the Burnout series. They left Criterion in 2014 to form an independent studio and took their ideas with them apparently. So what is different then? The most noticeable difference will be graphical fidelity. Danger Zone uses Unreal Engine 4 and runs on hardware that is two generations more advanced. The explosions are going to be spectacular, and the debris flying from the cars and environment should be realistic and detailed. Another difference is that Danger Zone will have just 20 levels according to IGN. Crash mode had 100 different intersections to terrorize. Let us not also forget that Crash was just part of a larger game. So from a content perspective, Danger Zone seems quite light. However, it would be possible to add more levels via downloadable content. Judging by the current business practices of many game studios, this is likely the plan. In fact, future DLCs are almost a given even if the game does poorly. 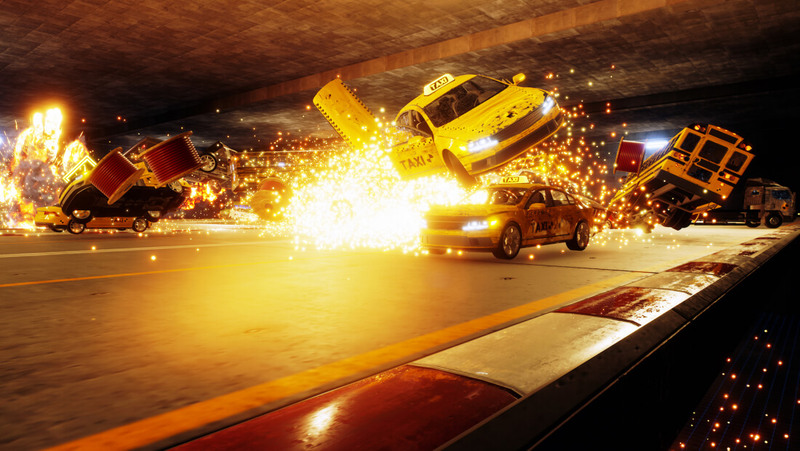 However, it is not really “all-new.” In fact, Criterion already tried this formula once with Burnout Crash! in 2011 with mediocre success at best. Burnout Crash! was a departure from the series that was lacking in many ways though, so perhaps “going back to our roots” is the key to this idea. Danger Zone will be released for PC via Steam and PlayStation 4 in May and will sell for $12.99.